Directory list of consulates and embassies in Dubai UAE with contact tel numbers, websites, email address, opening times, visa applications and other information. Search for "consular services" on embassy or consulate website if a visa section is not obvious. Check embassy or consulate website home page for any latest news about visa requirement changes (which might not be updated on respective visa information pages). Also/or check the Ministry of Foreign Affairs (MFA, MOFA) website for that country, especially if a consulate or embassy website is not found or not available. Check dress code, some consulates do not allow flip flops or shorts for men. To be safe wear shoes and long trousers. Dress code for women will probably allow flip flops but wear something else to be safe. Dress modestly rather than revealingly, especially for conservative countries, but there don't appear to be many explicit rules. Most or all consulates will have a security checkpoint before entering. Assume mobile phones not permitted inside consulate area (some exceptions). Expect a long wait for submitting visa applications. Usually busiest times are Sundays and day after public holidays. Arrive as early as possible to take a number. Check if payment for visa costs can be made by credit card or in cash. Some consulates only accept one or the other, some have changed (e.g. China from cash only to credit or debit card only in 2011). Make a copy for your own records of all documents you submit, including the application form. Keep the copies together and bring them with you when you travel to show at immigration. Passport must almost always have two blank pages, and be valid for at least 6 months from the expected date of arrival (check if date of departure specified) in the country. Occasionally longer (12 months), rarely shorter. UAE Residence Visa and Emirates ID might also need to be valid at least 3-6 months from planned arrival date. If this is not going to be possible, try and apply for visa ahead of time with earlier flight and hotel bookings, then change after a visa is issued. Visas are normally valid for 1 to 3 months before entry, and UAE residence visa and emirates ID expiry dates won't usually matter when traveling as long as they are still valid when you return to the UAE. This won't work for some visas which are date specific (e.g. Schengen visa), and won't work for passport expiry date since this will be checked before traveling. Passport information pages, residence visa, emirates ID. No Objection Letter (NOC) from employer (should state full name, nationality, start date, salary, position, and wording to the effect of the company has no objection to you traveling to the country of visa application). Salary certificate if salary not mentioned in NOC, with company stamp. Always bring the above documents even if not included in any country specific list of documents you see. What you read online (even on official websites) about required documents might be different from what they ask you for at the consulate or embassy. Remember to bring both passports if your currently valid residence visa is in an expired passport. Last 3 months bank statements (preferably stamped by bank). Sometimes any sort of evidence of sufficient funds is acceptable (a letter from a travel partner saying they will pay expenses for example), even if the requirements explicity say 3 months bank statements. If you have them, bring them, if you don't, apply anyway. Sometimes the proof of funds requirement is more likely to be asked at immigration when you arrive at the country, than when you apply for the visa. Company trade licence copy. If you are the company owner, bring the original also. Flight booking. Does not usually have to be paid for. Some airlines give you a 24 hr period to pay for a flight, so you can book, print, and submit that with your visa application. If the booking expires during visa processing it shouldn't matter. But try to confirm if you really must have evidence of a paid trip or not. Hotel bookings. Again, usually you can book online without payment (look for the free cancellation options), print and submit the booking page with your visa application. Travel insurance. For some applications (e.g. Schengen visa) this is essential. Travel itinerary. Consider this an essential requirement if applying for a particular visa for the first time. It can be changed once you arrive at your destination, no one is going to check if you stick to it. Type it up as a list of dates with location and accommodation (hotel, motel, or hostel name) specified. Remember to bring a copy with you when traveling to present at immigration if asked. And be familiar with what you have written. The consulate or embassy, or immigration, might ask you where you plan to go. If what you say doesn't match what you wrote, they will be suspicious. Do you have a job and home in the UAE to come back to? Do you have enough money to pay for your trip? Or is someone looking after you? Do you have a return flight? Are you not likely to try and become an illegal immigrant or overstayer? Visiting family and friends visa vs a visit or tourist visa? Usually it is easier to arrange a tourist visa, even if you are staying with family or friends. They will possibly or likely have to submit some official documents themselves for example proof of relationship, proof of where they live, proof of sufficient finances to look after you. Opening hours 0830-1600 Sunday to Thursday. Postal address: PO Box 113233, Dubai, UAE. Telephone: +971-4-3988229, fax +971-4-3988441, email: kbl22x@emirates.net.ae, website www.afghanconsulate.com (not www.afghanistanconsulate.com seen in some sources, it is spam). Consul General is Mr Atiqullah Atifmal (started April 2011). 05 Jun 2013 (WAM) - new Algerian CG reported as Abdelkrim Belouassaa. Telephone: +971-4-3444377, fax +971-4-3447164, email: algenconsdub@yahoo.com (?) (not confirmed - Yahoo address looks a bit suspicious). Opening hours: 0800-1530 Sunday to Wednesday, 0800-1445 on Thursdays, closed Thursdays, Fridays, public holidays. Previous telephone number +971-4-3212444 (no longer valid?). Previous email info@austrade.gov.au. Previous website www.austrade.gov.au. Telephone: +971-4-3447541, fax: +971-4-3447549, email: angola12@consuldubai.ae, website www.angoladubai.ae (maybe - only shows an Etisalat parking page when last checked). 19 Feb 2013 (WAM) - CG reported as Elka Pekka ("Elka Pekka of Azerbaijani"). Seems odd. New CG (different name) was reported in Dec 2012. 25 Dec 2012 (WAM) - new Consul General reported as Parviz Ismayilzade, also written as Parviz Ismailzade. 20 Jan 2011 (DTCM info) - Consulate General of Azerbaijan, PO Box 186160, Dubai, UAE. Tel +971-4-2355232, fax +971-4-2355234, email azconsul@eim.ae. 03 Nov 2011 - CG reported as Masdoor Rehmat (WAM). 22 Jan 2013 - CG Mohammad Abu Jafar reported as leaving - "... at the end of his tenure in the state" (WAM). Telephone: +971-4-2726966, fax: +971-4-2727965, email: bcgdubai@emirates.net.ae or bdootcw@emirates.net.ae. 21 Nov 2011 (DTCM info) - Consulate General of Bangladesh, PO Box 4336, Dubai, UAE. Tel +971-4-2727967, fax +971-4-2727965, email bcgdubai@emirates.net.ae. Website www.bdembassyuae.org. Previous or updated information telephone +971-4-2726966, email bdoot@emirates.net.ae. 01 Jun 2010 - new Consul General reported as Mohammad Abu Jafar (WAM) - "Consul General of Bangladesh in Dubai who came to offer greetings at the start of his tenure." 18 June 2012 (WAM) - Consul General name reported as Angel Kalinov. 29 Jul 2013 - Canadian embassy staff in Abu Dhabi have gone on strike over pay issues, resulting in delays for visa applications to Canada. It's not yet clear what staff in Dubai are doing - no information received yet. 16 Jun 2013 (WAM) - new CG reported as Rose Miller - perhaps the wife of Mr Ross Miller, previously reported as the new CG? 19 Dec 2012 (WAM) - new CG reported as Ross Miller. 14 Aug 2012 - Consul General Chris Pandy reported as leaving (WAM). New CG name not supplied. 21 Nov 2011 (DTCM info) - Consulate General of Canada, PO Box 52472, telephone +971-4-3145555, fax +971-4-3145556, email dubai@international.gc.ca, website www.uae.gc.ca. Previous or updated information - website w01.international.gc.ca? China = People's Republic of China (PROC), and includes Hong Kong and Macau, but HK and Macau have different visa regulations. HK and Macau visa applications are not done at the Chinese consulate in Dubai. Apply directly to Hong Kong or Macau immigration departments but most nationalities are eligible for visa on arrival or visa-free entry to HK and Macau. Taiwan = Republic of China (ROC), and visas for Taiwan are not applied for at the Chinese Embassy, but from Taiwan Commercial Office in Dubai, or eVisa online. Location: Villa 14, Street 7A, Al Safa 2 community district (Community 357), Jumeirah. Off Umm Al Sheif Rd (driving Al Wasl Rd to SZ Rd turn right just after Spinneys Umm Suqiem and follow the road around to the left). Postal address: PO Box 9348, Dubai, U.A.E. dubai.china-consulate.org/eng/ (not dubai.chinaconsulate.org or www.chinaconsulate.org, is spam). dubai.chineseconsulate.org/eng/ (not dubai.chinese-consulate.org or www.chinese-consulate.org, unavailable). ae.china-embassy.org/eng/ - UAE (Abu Dhabi) Embassy website. Email: chinaconsul_db_ae@mfa.gov.cn. Old address chncnslt@hotmail.com no longer valid? 30 Mar 2016 - Chan Jingbao reported as CG to the UAE ("Consul-General of China to the Country"). Not clear if that means ambassador to UAE or CG to Dubai. No other reference to Chan Jingbao found, not in list of CG names from Chinese MFA, but there was a Zhan Jingbao as CG (tenure ended Apr 2014). Neither name in list of ambassador names from Chinese MFA. 28 Feb 2016 - Jin Lei reported as "Consul-General of Economy and Trade for the Republic of China in Dubai" (WAM). Not clear if report meant People's Republic of China (PROC, China) or Republic of China (ROC, Taiwan). There was another report of (the same?) Mr Lei attending the 2016 MEFCC in April where he was a representative of the PROC: "Mr. Jin Lei, the commercial counselor of the Economic and Commercial Section of the CONSULATE-GENERAL". 18 May 2015 - Ms Li Lingbing reported as new CG to Dubai (also reported as starting her tenure in Dec 2015 and Apr 2016). 10 Feb 2015 - Mr Tang Wei reported as leaving CG Dubai position. 03 Feb 2015 - Ms Li Lingbing reported as CG to Dubai. 17 Apr 2014 - Mr Tang Wei reported as CG in Dubai (reported as new CG on 17 Jun 2014 and 30 Nov 2014). Mr Tang Weibing CG Dubai (17 May 2014 report). 09 May 2010 - Mr Zhan Jingbao reported as new CG in Dubai. 23 Aug 2010 - Mr Gao Youzhen reported as leaving. 03 Jan 2006 - Mr Gao Youzhen reported as new Consul General appointment. Mr Yang Weiguo, Consul General before 2006 (started 05 Jan 2005?). [??] Zhang Zhijun, CG Dubai (29 Nov 2003 report). But was Ambassador to Abu Dhabi? 1988 - General Consulate of China first opened in Dubai. Diplomatic relations started in Nov 1984 (25 years of diplomatic ties celebrated on 29 Sep 2009 (WAM)). http://www.fmprc.gov.cn/mfa_eng/wjb_663304/zzjg_663340/xybfs_663590/gjlb_663594/2903_663806/ - Ministry of Foreign Affairs of the People's Republic of China website page for UAE. http://www.fmprc.gov.cn/mfa_eng/ziliao_665539/wjrw_665549/lrls_665575/xybf_665579/t164353.shtml - Consuls General to Dubai. http://www.china.org.cn/english/Embassies/197543.htm - Chinese government information portal, Dubai Consulate page. [Check] Location was Al Jafiliyah? When? http://ae.china-embassy.org/eng/lsyw/1/1/ - reference for Chinese visas from Abu Dhabi Embassy website. Hong Kong, Macau, and Taiwan have separate and different visa rules from mainland China, and also have their own border and immigration controls. Having a visa for mainland China does not automatically allow you to enter Hong Kong, and vice versa (same for Macau and Taiwan). Apply for HK and Macau visas but not Taiwan at Chinese Consulate, apply for Taiwan visas at Taiwan Trade Office in Dubai, or eVisa online. The island of Hainan has more relaxed visa requirements than mainland China but still falls under the jurisdiction of mainland China immigration. There are other visa-free entry possibilities to various cities, zones, and regions, for example the Pearl River Delta for tour groups originating in Hong Kong and Macau, 24 hr transit visa, several cities with 72 or 144 hour airport issued transit visas, Special Economic Zone (SEZ) visa on arrival (VOA). Check carefully with an official source (don't assume Wikipedia is 100% accurate e.g. it omits Philippines from nationality list ineligible for SEZ visa on arrival) which rules apply to which nationalities and be aware that they can change unexpectedly. Remember a transit visa is not possible if you fly from China directly back to your origin country (e.g. HKG > PEK > HKG no transit visa, HKG > PEK > DXB can use transit visa if PEK > DXB flight does not stop in HKG, HKG > PEK > PVG > DXB no transit visa because PVG still in China). Apply at consulate, timings Sun-Thu 0900-1200 for application, 0900-1100 (not 1030) for passport and visa collection. Take a number and wait a couple of hours at least (allow about 20 numbers per hour). Sundays and days after public holidays have the longest waits. Ramadan hours 1000-1200. Consulate closed on UAE and Chinese public holidays (several days for Chinese New Year in January). No obvious dress code restrictions but for men wear trousers and no flip flops to be safe. Mobile phones permitted inside consulate compound. Actual application reasonably quick and straightforward (possibly depending on nationality). Officer will check documents and ask a few questions if clarification needed. Bank statements required according to list of documents but this might be flexible (we did not submit them in our case, nor were we asked for them). Express visa possible but instructions posted in consulate sound stringent, decision made by consulate not by applicant. In practice, it seemed that express visa request was no problem. Normal tourist visa takes 4 days, express visa 3 days. There is possibly an urgent express visa in 2 days. No notification email or sms sent for visa being ready, just go and collect on the correct day. Visa payment done when collected not when applied for. Note that any information saying payment must be cash, is out of date, since 2011, when the consulate changed the rules from cash only to credit card only. Visa application form available at consulate and online. http://dubai.china-consulate.org/eng/lsfw/qzyw/ - reference page for visa application form and instructions. http://dubai.chineseconsulate.org/eng/lsfw/qzyw/t1375855.htm is the up to date version (28 Jun 2016) and does not mention requirement for NOC or invitation letter (hotel bookings are required). But bring an NOC if you can anyway, and a trade licence copy (conflicting information about whether this is required for everyone or only company owners). Cyprus - see Cyprus Embassy in Abu Dhabi. No consulate in Dubai? 02 Nov 2010 (press release) - Cyprus Tourism Organization announced a new visa application and processing center in Dubai for tourists and visitors to Cyprus coming from Dubai and the Northern Emirates. The center establised by the Embassy of the Republic of Cyprus in the UAE and VFS Global LLC (a subsidiary of Kuoni Travel Group in Zurich). Cyprus visa center location in the Atrium Centre, next to Citi Bank on Bank Street (Khalid Bin Al Waleed St) in Bur Dubai, opening times 0900-1700 Sunday to Thursday. No appointment necessary. Update: telephone +971-4-3592279. Telephone number +971-4-2282411 listed in some sources is for the Cyprus Trade Center in the Al Ghurair Center, website www.ctcdubai.org. There is no Cyprus consulate in Dubai as far as we know. 21 November 2011 (DTCM info) - PO Box 2988, Dubai, UAE. Tel +971-4-3480877, fax +971-4-3480899. Email dxbgkl@um.dk, website www.dtcdubai.um.dk. Previous or updated telephone +971-4-2227699 (not confirmed)? 26 Sep 2012 (WAM) - new Egyptian CG to Dubai reported as Sherif Fouad El-Bedaiwi (Sherif Fuad Al Bedawi?). Also seen written as Sherif El Bedewy, Sharif Fouad Al Bedewy. 21 Nov 2011 (DTCM info) - Consulate General of Eriteria, PO Box 42411, tel +971-4-2220323, fax +971-4-2220565, email erconsul@emirates.net.ae. 09 Oct 2012 (WAM) - Ethiopian Consul-General in Dubai reported as Mesganu Arga Moach. 08 Oct 2013 (WAM) - French Consul General in Dubai reported as Eric Giraud-Telme (Eric Giraud Telem). Website also at www.vfsglobal-fr-ae.com? For Schengen visa applications? Some sources list website as www.mfe.org, which is for Maison des Francais de l'Etranger (MFE) and has French consulate information worldwide (in French). Website provided by the ministère des Affaires étrangères et européennes (French Ministry of Foreign Affairs)? This section refers to Georgia (capital Tbilisi) in the Caucasus Region, one of the ex-USSR states, sharing a border with Russia, Turkey, Armenia and Azerbaijan. 19 May 2015 - "Georgian Embassy was opened in Abu Dhabi, General Consulate was opened in Dubai" (ref Georgian Prime Minister's Press Office). Location, contact details, CG, and Ambassador names not provided. No other reports found of Georgian Missions opened in the UAE. No information on UAE MOFA or Georgia MFA websites about diplomatic representation located in the UAE. Georgian Embassy in Kuwait has jurisdiction for the UAE. See Embassies in Abu Dhabi page for more information. Note that for travel to the state of Georgia in the USA (state capital Atlanta), you need a USA visa. Georgia is not part of the EU or Schengen area (and unlikely to be anytime soon, or ever), but Schengen visa holders can enter Georgia either without a visa, or with a VOA (visa on arrival), as of Sep 2015, irrespective of nationality in most cases (double check with Georgian embassy or consulate, or Timaticweb to confirm). UAE residence visa holders are eligible for VOA in Georgia, as of Sep 2015, irrespective of nationality in most cases. Note that your residence visa must be valid until a date after your planned departure from Georgia. [Check] VOA and/or e-visa only valid for airport arrivals? 28 Oct 2015 (Gulf News report, "UAE resident claims he was denied entry into Georgia over beard"): entry to Georgia was denied for bearded Indian Muslim male resident of the UAE. He claims it was because he had a beard, based on his observation that a clean-shaven work colleague on the same flight (also Indian, Muslim, gender not reported, UAE resident) was permitted to enter the UAE. The official reason for refusal was not clear from the report, and a Georgian Embassy in Kuwait official seemed to miss the point, stating that Georgia had opened its borders to citizens of Arab countries (the access-denied chap was not a UAE or any other Arab country citizen). Muslims, Indians, UAE residents, and bearded men are all generally and frequently permitted to enter Georgia so who knows if it was the combination of all 4 factors, or something else which resulted in him being denied entry. Reasons for entry being denied are more usually because of a lack of travel insurance, sufficient funds, accommodation, expired or too close to expiry date of passport or UAE residence visa. www.evisa.gov.ge is website for online visa application. Cost is US$20, payable by credit card. Website also says by debit card but some people have reported problems with this method, however the payment can be made by someone other than the applicant so ask a friend with a credit card to pay for you if you only have debit cards. Processing time given as within 5 working days. Assume that means Mon-Fri working week, not Sun-Thu (as in the UAE). However, your travel date must be at least 10 days from application date, because the visa validity period will start from the travel date you enter, and the online form does not allow you to choose a date within 10 days of your application date. 08 Oct 2013 (WAM) - German CG reported as Klaus Ranner (Consul General in Dubai at Foreign Office of the Federal Republic of Germany). German consulate in Dubai covers emirates of Ajman, Dubai, Fujairah, Ras Al Khaimah (RAK), Sharjah, Umm Al Quwain (UAQ). Residents of Abu Dhabi and Al Ain should refer to the German Embassy in Abu Dhabi. Website domain at www.germanconsulatedubai.org.ae no longer valid (last checked March 2011), use www.dubai.diplo.de. Tel +971-4-523352 updated to +971-4-3972333, or +971-4-3974291 for visa and consular section. Opening hours 0800-1100 Sunday to Thursday. Location is Dubai Islamic Bank building, Khalid Bin Al Waleed Road (Bank Street), Bur Dubai, near the Bur Juman Shopping Center, Bur Dubai. Emergency telephone number in UAE for German nationals only is +971-50-6504134. Greece - see Greek Embassy in Abu Dhabi, no consulate in Dubai? Greece Commercial Section in Dubai. 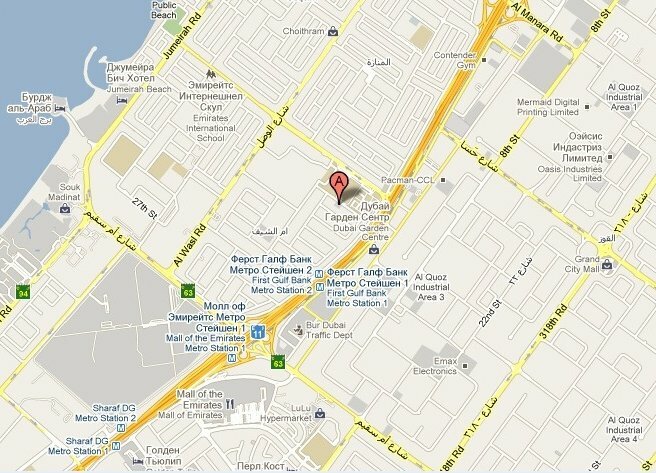 Location address: Office 801, Reem Tower (next to Khaleej Palace Hotel), Al Maktoum St, PO Box 7706, Dubai. Contact details: tel +971-4-2272106, fax +971-4-2272253, email ecocom-dubai@mfa.gr, tradegr@eim.ae, or tradegr@emirates.net.ae, website www.agora.mfa.gr/ae53. The Indian diplomatic mission in Dubai is sometimes referred to as the Indian Embassy in Dubai (more often than most other countries' missions it seems), but both the Indian Consulate in Dubai and the Indian Ministry of External Affairs refer to the mission as the Consulate General of India in Dubai, not the Embassy. 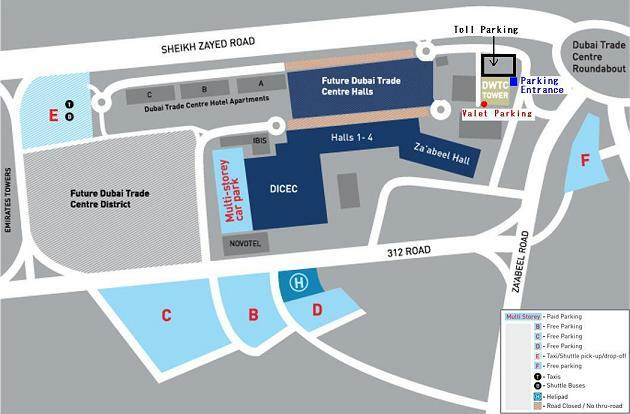 Location - Diplomatic Enclave, Al Hamariya, Bur Dubai (8th St, next to Oman Consulate opposite mosque). Postal address - PO Box 737, Dubai, United Arab Emirates. Telephone +971-4-3971222 or +971-4-3971333, fax +971-4-3970453. Email cgidubai@cgidubai.com or cgidubai@eim.ae (email cgidubai@emirates.net.ae should also be valid). Website www.cgidubai.com (available). Office timings 0800-1630 Sun-Thu, consular services (passports, visas, etc) 0800-1200 Sun-Thu. Consul General - Sanjay Verma (CG Dubai info). Consul General - Anurag Bhushan, Deputy Consul General - P. K. Ashok Babu (MEA info, P. K. Ashok Babu is the Commerce & Protocol Consul according to the CG of Dubai). Indian visa applications - first apply online at www.indianvisaonline.gov.in/visa/, then submit application documents to a BLS Indian Visa Center - website www.blsindiavisa-uae.com, BLS helpline tel +971-4-2555530. 28 Dec 2013 - new Indian CG is Anurag Bhushan, replacing Sanjay Verma who has a new position as Indian Ambassador to Ethiopia. 30 Jul 2012 - Indian consulate website at www.cgidubai.com has apparently been hacked, or is down due to technical issues, depending on who you listen to (seems to be blocked in the UAE when last checked). Alternative sites for downloading visa or passport application forms are the Indian Embassy in Abu Dhabi (www.indembassyuae.org), or BLS International Passport and Visa Services (see below). 21 Nov 2011 (DTCM info) - Consulate General of India, PO Box 737, Dubai, UAE. Tel +971-4-3971333 or +971-4-3971222, fax +971-4-3970453, email cgidubai@emirates.net.ae, website www.cgidubai.com. 06 Apr 2011 - Indian Consulate has outsourced visa and passport services to BLS International from 06 April 2011. Tel +971-4-3594000. Website at ww.blsindiavisa-uae.com. Venu Rajamani was a former Indian Consul General in UAE (dates unknown, reference TNN report 06 Jan 2013). 23 Dec 2013 (WAM) - new Indonesian CG is Imam Santoso. Consul General: Mansyur Pangeran or Dr Faisal Harun (both names supplied, not clear which one is correct). Opening hours for visa applications - Sunday to Thursday 0900-1300 for submissions, 1400-1600 for collections. 15 May 2013 (WAM) - Consul General, Ali Asghar Shafi'i, reported as leaving. New CG name not supplied. 02 November 2011 - new Consul General, Esmat Sadeeq, reported by WAM. 28 Sep 2012 - Consul General of Italy in Dubai reported as Giovanni Favilli (Gulf Today report about the opening of the new Ambassador Kindergarten in Dubai). Website domain www.italianembassy.org.ae listed in some sources appears to be unavailable (last checked January 2012). Opening hours: Sunday, Tuesday, Thursday: 0900-1200. Monday and Wednesday by appointment only. For Schengen Visa applications in Dubai, visit the Joint Visa Application Center Dubai (JVAC). It seems to be a waste of time trying to apply to the Italian consulate directly to submit your application - they will just redirect you to the JVAC. 09 Aug 2014 - CG Matsunaga Daisuke departing, to be replaced by Mr Hisashi Michigami (CG message dated 23 Jul 2014). 30 May 2012 - new consul general reported as Daisuke Matsunaga (WAM news) (or Matsunaga Daisuke). Arrived 19 Apr 2012, previously based in Hong Kong (CG message). 26 Apr 2012 - Japan Consulate in Dubai accepts Japanese visa applications from residents of Afghanistan and Iraq, starting 01 May 2012. Japanese Embassy in Abu Dhabi also accepts applications from Afghanistan residents. 29 Jan 2012 - WAM news reported that the Japanese Consul General in Dubai, Takashi Ashik (Takashi Ashiki), was leaving. 22 Aug 2009 - Japanese Consul General in Dubai is Mr Kazuhisa Yamada? Opening hours: Telephone 0800-1500 (1400 during Ramadan), consular services (passports) 0900-1330, visa applications 0900-1200, visa collection 1200-1330. Location: 28th Floor, Dubai World Trade Center, Sheikh Zayed Road. Postal address: Consulate General of Japan, PO Box 9336, Dubai, UAE. Email addresses dubai@cgjapan.ae, cgjapan@emirates.net.ae, cgjapan@eim.ae, dubai@du.mofa.go.jp (general enquiries), ryouji@du.mofa.go.jp (visa enquiries). Website: www.dubai.uae.emb-japan.go.jp, in English and Japanese. 07 Oct 2013 - A press release update from the Japanese Consulate in Dubai said that UAE citizens applying after 15 Oct 2013 for short-stay visas to Japan would be given a multiple entry visa valid for 3 years, with a 90 day limit on each visit. New visa type is restricted to Emiratis living in the UAE according to the announcement. The actual statement reportedly said "The Japanese government will issue multiple visas for a ‘temporary visit’ for UAE nationals who reside in the UAE" (statement not supplied). Most media publications reported the 3 year validity period but it wasn't clear if that was explicitly stated in the press release. The "temporary visit" category includes business trips, tourists, visits to friends and relatives, and similar reasons. Announcement not found on Japanese consulate or embassy websites for the UAE. The Japanese Consulate in Dubai issues Japanese visas to UAE residents in Dubai and the "Northern Emirates" (Ajman, Fujairah, Ras Al Khaimah - RAK, Sharjah, Umm Al Quwain - UAQ), and UAE nationals. Expat residents of Abu Dhabi (including Al Ain) should apply to the Japanese Embassy in Abu Dhabi. UAE citizens living in Abu Dhabi emirate should probably apply to the embassy there also (depends how you interpret the information on the DUbai consulate website). 25 January 2012 - new Consul-General reported (WAM news) - Saqr Abu Shatal Al Nuaimi. Actual start date of appointment not supplied. 06 February 2012 - new Consul General is Mr Askar Shokybayev (Askar Shokybayav) (was previously Consul General in Istanbul, Turkey). Previous Consul General in Dubai was Mr Kairat Saki (not confirmed)? Telephone +971-4-3397156, fax +971-4-3306937. Postal address: PO Box 14180, Dubai, UAE. Email dubai@mfa.kz, website www.kazconsulate.ae. Some sources list web domain as www.kz-consulate.ae but that appears to be out of date or incorrect (no website found when checked Feb 2012). Location: Villa 14, Street 3, off Al Thanya Rd (behind Emirates International School - EIS location on map marked incorrectly), Umm Al Sheif (Jumeirah - Umm Suqeim). Opening hours: 1100-1300 for document submission, 1500-1700 for document collection. Open Monday-Thursday; closed Friday, Saturday. And closed on Sunday (according to website)? 22 May 2013 (WAM) - new Consul General reported as Mr Kariuki Mugwe. Previously Acting Consul-General was John Kyovi Mutua. Kenya Consulate, Jumeirah Beach Road, near Mercato Mall, Jumeirah, Dubai, UAE. Postal address not supplied. Consular services also available on Wednesdays 0900-1300 at Kenya Airways HQ in Dubai. See either South Korea (consulate in Dubai and embassy in Abu Dhabi) or North Korea (but no diplomatic representation found for the UAE - last checked 18 Dec 2013). 19 Dec 2013 (WAM) - new Kuwaiti CG reported as Theyab Farhan Al Rasheedi. 01 Sep 2013 (WAM) - CG Tareq Khalid Al Hamad (Tariq Khalid Al Hamd, Tarek Khaled Al Hamad) reported as leaving. New CG name not supplied. Telephone +971-4-3978000, fax +971-4-3977707, email kuwaity@emirates.net.ae. Kuwait Ministry of Foreign Affairs (MOFA) website at www.mofa.gov.kw (Arabic only). Postal address: PO Box 806, Dubai, UAE. Reference seen to Kuwait consulate website at www.cgidubai.com? Presumably an error - domain is for the Indian Consulate in Dubai. 24 May 2012 - new Kyrgyz Consul General reported as Kuban Omuraliev (also seen written as Omuraliev Kubanychbek or Kubanychbek Omuraliev). Previous CG name was Tohtohodjaev Anvar Rozamovich. Date of change not supplied. Kyrgyz Republic (Kyrgyzstan) Ministry of Foreign Affairs website information (www.mfa.kg). Other sources list different contact numbers (telephone +971-4-2733305 and fax +971-4-2733321), email addresses (akylbek@emirates.net.ae, musarova@mail.ru), Consul General names (Mr Akaev Baktybek Bolotovich), locations (Villa 3, 122-105 Abu Baker Al Siddique Rd, Abu Hail; opposite DNATA Building, Deira), websites (www.kyrgyzconsuae.org - had a malware warning from Google but maybe no longer as of March 2011, www.dubai.mfa.kg - not available). 28 Nov 2012 (WAM) - New Lebanese CG in Dubai reported as Sami Al Nimir. 02 Jul 2012 (WAM) - Consul General, Ms Dona El Turk (Donna Turk), reported as leaving. New CG name not supplied. Lithuanian Consulate opened in Dubai in 1995. No Lithuanian embassy in Abu Dhabi? Diplomatic relations between the UAE and Lithuania established 16 October 1992. 19 Dec 2012 (WAM) - new Moroccan Consulate General reported as Abdelali Jay. Previous CG was Ahmed Ismail Al Alawi? Location: Villa No 3, street 8A, Jumeirah 1 (behind Dubai Zoo). Tel +971-4-3496355, fax +971-4-3496388, email help@moroccanconsulate-dubai.com, website www.moroccanconsulate-dubai.com. 09 Aug 2010 (WAM) - New Consul-General of Mozambique to UAE reported as Cristiano Santos. New location (since 2011?) 30th floor, Al Habtoor Business Tower, Dubai Marina. Tel +971-4-4407600 for general enquiries, timings 1000-1100 and 1400-1500 Sun-Thu, email dba@minbuza.nl. Visa enquiries by email only to dba-visa@minbuza.nl. Previous location ABN Amro building, Khaleed Bin Al Waleed St (Bank St), Bur Dubai, tel +971-4-6321920. Previous website domain www.netherlands.ae forwards to uae.nlembassy.org for the NL Embassy in Abu Dhabi (has link to NL Consulate in Dubai page). 10 Oct 2012 (WAM) - new Netherlands CG to Dubai reported as Robert J. H. de Leeuw. Also seen written as Robert DeLeo. 28 Jun 2012 (WAM) - Dutch Consul-General, Kees van Spronsen (Mr K.V.A. Van Spronsen), reported as leaving. New CG name not supplied. New Zealand Consul General Wayne Mikkelsen until May 2011 (WAM news 01 June 2011). 24 Sep 2013 - NZ joins the growing list of UAE based consulates and embassies using the VFS Global visa processing services. A service that some or many customers regard as inefficient and unhelpful, unless you bribe them use their VIP services. However, on the bright side, parking is easier since VFS Global moved to the Wafi Center, and there is a (small) food court for hungry applicants. The NZ Visa Application Center (NZVAC) run by VFS Global is located in the Wafi Center mall, 2nd level, same place as a number of other visa application centers run by VFS Global (including Australia and the UK), opening date was 18 Sep 2013. NZVAC opening hours Sun to Thu 0900-1700 for application submission, 1100-1700 for passport collection. Note that NZ visa applications are still reviewed by Immigration New Zealand (INZ) and approved or denied by INZ. VFS is more of an initial collection point for documents. VHS NZ contact details: hotline call center tel +971-4-2055885, email info.inzdxb@vfshelpline.com, website www.vfsglobal.com/newzealand/uae. North Korean consulate in Dubai not found. No North Korean diplomatic representation in the UAE according to UAE MOFA information. However, the UAE Ambassador to South Korea is also non-resident Ambassador to North Korea, Abdullah Khalfan Mattar Al Rumaithi according to WAM news 23 Sep 2012, perhaps he knows. DPRK MOFA information not supplied. Last checked 18 Dec 2013. 14 Dec 2013 - a report in The National about two North Koreans in an Abu Dhabi court for the charge of attempted murder said A court official said there was not a North Korean embassy in the UAE, so they would approach the North Korean consulate in Dubai about finding a translator. We'd say good luck, we couldn't find the Dubai consulate, and apparently neither can the UAE Ministry of Foreign Affairs. Correct phone number is +971-4-3823880 for Norwegian consulate in Dubai. Number given as +971-4-6211221 is incorrect, is for embassy in Abu Dhabi but with incorrect area code - Dubai (04) instead of Abu Dhabi (02). Websites at www.mofa.gov.pk/consulates/dubai/ (Pakistan MOFA) and www.pakistanconsulate.ae. Not clear which one is more up-to-date or if both are official websites (last checked 28 Sep 2012). Opening hours Monday to Friday 0900-1700 according to website (not clear if that is correct, or should be Sunday to Thursday - UAE weekends are Friday-Saturday). Contact details and location - Khalid Bin Waleed Road, Bur Dubai. Postal address PO Box 340, Dubai, United Arab Emirates. Phone: +971-4-3973600, fax: +971-4-3971975, email: parepdub@emirates.net.ae (last checked 21 Apr 2012), or parepdub@pakistanconsulate.ae (last checked 28 Sep 2012)? Previous or alternative telephone number is +971-4-3970412. Pakistan - new Consul General, Abdul Hamid, appointed in February 2006 (12 February 2006 press release). Amjad Ali Sher was Consul General from 2009-2010? Tariq Iqbal Soomro newly appointed as Consul General 06 October 2010 (previously CG in Bradford, England)? 03 Oct 2013 (WAM) - CG or Ambassador reported as "... Ambassador Issam Massalha, Consul-General of Palestine ...", not clear if he is in Abu Dhabi as Ambassador or Dubai as CG. Previous information is that the Palestinian ambassador to the UAE in Abu Dhabi is Dr Khairi Al Aridi. Not clear if there has been a change. Dirección de la Oficina Consular - 25th Floor, Al Habtoor Business Tower, Dubai Marina, Dubai, Emiratos Arabes Unidos, PO Box 213243. Telephone (Teléfono de Oficina): +971-4-4227550, fax: +971-4-4472023. Email - Asuntos Consulares Correo: consulate@peru.ae, Oficina Económico Comercial del Perú Correo: trade@peru.ae. Opening hours 0900-1600 Sunday to Thursday (Horario de atención al público, De domingo a Jueves 09:00am a 4:00pm). 28 June 2011 - Peruvian Consulate General (Consulado General del Perú en Dubai) and Trade and Investment Office in Dubai - establishment announced in press release, contact details and location not supplied. Opened in May 2011? Or August 2011? 08 Jun 2013 (Emirates 24-7) - Philippines CG reported as Frank R Cimafranca. 17 Jul 2012 (WAM) - Philippine Consul General, Benito B. Valeriano, reported as leaving. New CG name not supplied. Location: Villa 46 or 48 [check], Street 2C, off Street 35A, off Beirut Rd (turn right onto 35A, and first right again if driving or in taxi), Al Qusais 3 (Al Ghusais 3), near Muhaisnah area and Al Qusais Pond Park. Nearest bus stop very close (50m), on Beirut St in Sharjah direction just after cafeteria and mosque. Walk through on the path between the villas to Street 2C. Buses which stop there: Bus route 33 (from Al Ghubaiba Bus Station), bus route 13 (from Gold Souq BS, passes Al Qusais Metro Station), route 32C (from Al Satwa BS, passes Emirates HQ Metro Station). Nearest bus stop on other side of Beirut St (1km) is a bit of a walk - after the pedestrian bridge at Street 21C. Nearest metro station (1.5km) is Al Qusais on the green line, but still a long walk, especially if summer (too long, take a taxi or bus number 13). Car parking is relatively easy in nearby streets. Plenty of taxis available. [Update] Not in Al Wuheida area. Was a previous location or information error? [Check] Some sources say Philippines Embassy (not Consulate?) address is Villa 19, Street 16, off Abu Hail Road, Hamriya area. Tel or fax +971-4-2669681, +971-4-2669643. Email general enquiries pcgdxb@pcgdubai.ae or pcgdxb@gmail.com. Passport enquiries dubaipassportinquiries@gmail.com. Legal and other assistance for Filipino citizens atnpcg@gmail.com. Postal address: PO Box 94778, Dubai, United Arab Emirates (UAE). Phone number provided as +971-4-6345664 is incorrect, looks like an old or incorrect tel number for the Philippine embassy in Abu Dhabi (+971-2-6345664) with Dubai area code (04) instead of Abu Dhabi area code (02). Consulate information says "No Noon Break" however this sounds incorrect. Some or all departments close from 1200-1300 (and bad luck if you're almost at the front of the queue when they do; come back after lunch and start queuing again). Just to confuse things, they also say "The Consulate General premises is closed 12:00 nn - 1:00 pm (Lunchbreak)." If you're still in a queue at 5pm when the consulate closes, you might be permitted to stay and complete a procedure. Allow all day to get anything done. Some procedures might only take half a day but don't count on it. Friends and family of consulate staff can usually jump the queue. Bring photocopies of everything (x3), the queue for the photocopy machine is long. Fill in any relevant forms you can find online and photocopy them. If you do have to copy something and you have a car, it might be quicker to drive somewhere nearby such as Madina Mall, Lulu Center, Al Twar Center, or Al Nahda Road and do it at a typing and photocopy services shop. Official website at dubaipcg.dfa.gov.ph. No website at www.pcgdubai.ae (parking page only, used for emails). Apparently they use their Facebook page for official communication also? Perhaps Boo the dog can apply for a visa (yes he really is on FB, and he has more Likes than you). Staff are generally about as grumpy as you'd expect from a busy consulate or embassy, and usually look like they'd rather do something else than help you, whether or not you're a Filipino. Try to avoid going there from April to October, or bring a portable a/c unit and umbrella. You'll be waiting outside in queues in hot sun with no shade. Bring water. 20 Jan 2015 (MOFA Qatar): New Consul-General reported as HE Ahmed bin Ali Al Tamimi. Umm Hureir 1, near Dubai Creek. 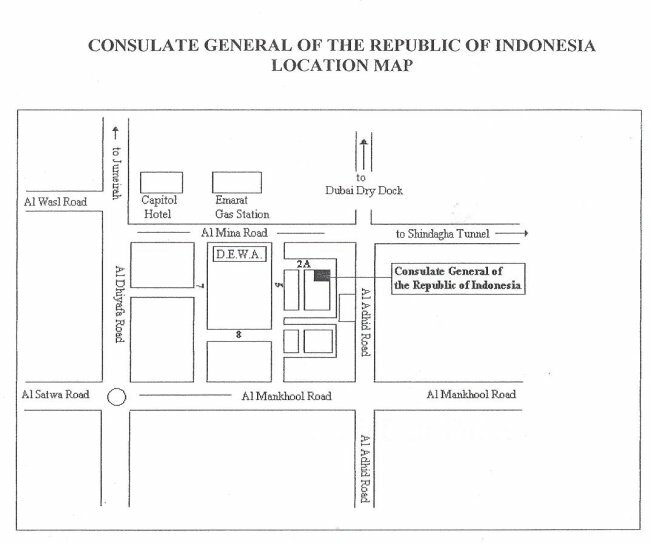 Embassy and consulate area. Tel+971-4-3960444, fax +971-4-3966681 (ref: MOFA Qatar). Or +971-4-3982888, fax +971-4-3983555 (ref: UAE Yellow Pages). [Check] next to Saudi consulate and Libya consulate. [Check, when?] Was in Al Jafiliya near Smart Childrens Nursery and Chinese Consulate? Postal address PO Box 1877, Dubai, UAE. Website www.mofa.gov.qa (Arabic and English). URL english.mofa.gov.qa is not available. Email dubai@mofa.gov.qa (MOFA-Qa) or qatar98@emirates.net.ae (old information). Mr Ahmed bin Ali Abdulrahman Altamimi (20 Jan 2015). Mr Fares Bin Rumi Al Neami (ref: UAE YP, possibly an error, he is Ambassador in Abu Dhabi). 06 Sep 2014 - CG is Dan Marian Parvulescu [check]. Previously was Dl Niculaie Goia. Date of change not provided. 03 Jan 2012 - CG is Dl Niculaie Goia. www.mae.ro - Romanian Ministry of Foreign Affairs (MFA), Ministerul Afacerilor Externe (MAE) website. In Romanian, English, French. Note that visa requirements for UAE residents might differ slightly from what the MAE website says - check the Dubai consulate website. evisa.mae.ro/home - Apply for a Romanian visa online, in English and Romanian. Visit to consulate or embassy also necessary after submission of form and documents online - you'll be given an appointment date and time. If you go to embassy or consulate first you might be sent away to apply online and make an appointment, or they might start processing your application straightaway. Visa applications: the consulate will tell you takes a couple of weeks for processing, and if you haven't received notification your visa is ready, that you should send an email (roconsdubai@gmail.com) to enquire about your visa. However you might or might not get a response. If you get no response either try phoning them or go there during visa collection time. Location - Street 12b, Villa no. 44, Community 332, Jumeirah 1. Behind Magrudy's bookshop and Jumeirah Center. [Check] Some maps show location as villa 36 or 38, street 12b. Look for Romanian (red, yellow, blue) and EU (blue) flags. Postal address - PO Box 333765, Dubai, UAE. Telephone: +971-4-3492971, fax: +971-4-3492979, email: roconsdubai@gmail.com. Website: www.mae.ro/en/romanian-missions/3265 (Romanian Ministry of Foreign Affairs). Obtaining a Russian visa: A letter of introduction/invitation (LOI) might be required. Check before obtaining one online, the Russian Consulate in Dubai might require the original, not a printout. Safer option might be to go through a travel agent. The website for the Russian Consulate in Dubai appears to indicate an LOI is not needed for a 30 day tourist visa (required documents are passport, photo, health insurance, round-trip ticket, travel voucher) so maybe a hotel booking confirmation is sufficient, or maybe not. Check with the consulate directly (Abu Dhabi embassy website says an invitation is required). New Russian Consul General in Dubai reported as Gocha Buchidze (WAM news 05 March 2012). Name might also be written as Gocha Buachidze or Gocha Levanovich Buachidze? Consul General of the Federal Republic of Russia, Sergei Krasnogor, leaving (WAM news 11 Jan 2012). New Consul General name not supplied. Contact details: Telephone +971-4-3285347, fax +971-4-3285615. Website domain www.gconsdubai.mid.ru. Watch out for a large number of what appear to be official Russian consulate websites but aren't, however they do have convenient visa services (for a price) which might or might not work. Location (new, date of change unknown): Villa 21, Street 6B (at corner with Street 10A - map location is a bit inaccurate), Community 367-432, Umm Al Sheif (Jumeirah - Umm Suqeim). Between Al Wasl Rd and Sheikh Zayed Road (Mall of the Emirates exit). Opening hours Monday to Thursday 1000-1330, and additionally 1500-1700 on Wednesday? Closed Friday, Saturday. And closed Sunday? Opening hours: 1000 to 1330, Monday to Thursday (not Sunday?). Telephone +971-4-2231272, fax +971-4-2231585, address: Office 307, Al Maidan Tower, Al Maktoum Road, Deira, Dubai. General Consul: Sergei Alexeevich Krasnogor. Some sources have website listed as www.russianembassy.net, which lists Russian consulates and embassies worldwide, but is not an official Russian government website. 08 Oct 2013 - Saudi CG reported as Imad Adnan Al Madani (Consul General of the Kingdom of Saudi Arabia to Dubai) (also written as Emad Adnan Madani?). Phone Number: +971-4-3979777, fax: +971-4-3979614, email: aecon@mofa.gov.sa, website: www.mofa.gov.sa. 20 Jan 2013 (WAM) - new Singaporean CG is Cheong Ming Foong. Also written as Xiong Ming Fung (WAM 26 Feb 2013)? Previous CG was Umej Singh Bhatia (date of change not supplied)? No Slovenian Consulate in Dubai. Slovenian Embassy in Abu Dhabi but for visa applications, go to German Consulate in Dubai: "Visa applicants who are not citizens of UAE and live in UAE can apply for visa at the Consulate General of the Federal Republic of Germany"
German Consulate website for UAE has no information about applications for a Slovenian Schengen visa. Germany uses VFS Global for short term visa applications from UAE, but VFS Global Germany pages have no information about applying for a Slovenian Schengen visa. Wikipedia says Slovenian mission in Cairo is accredited to UAE but not confirmed with Slovenian MFA. VFS Global page for Slovenian visa applications in Egypt says only Egyptians and legally resident foreigners in Egypt can apply in Cairo or Alexandria. 11 Sep 2012 (WAM) - new Somali CG to Dubai reported as Omer Abdul Aziz Noor. Tel +971-4-2722559. New phone number? Previous information was +971-4-2958282. Fax +971-4-2711203. Postal address PO Box 63993, Dubai (not confirmed)? Email jeebo@somcon.ae. Somalia Embassy in UAE website (www.uae.somaligov.net) has different information for Dubai consulate - Tel +971-4-2223030, fax +971-4-2274570, postal address PO Box 23900 Dubai UAE. Another email address might be zeinab.somcon@gmail.com (not confirmed, seen in other sources). Somalia Ministry of Foreign Affairs website at www.mfa.somaligov.net. Opening times 08:30-15:30 (Sun to Thur, closed Fri and Sat). Consul General is Seongdoo Ahn (name also reported as Ahn Seong-Doo). Location: Villa 39, Street 24b, Jumeirah 2, Dubai. Postal address: PO Box 126127, Dubai, UAE. Tel +971-4-3449200, fax +971-4-3449183, email dubai@mofa.go.kr (email is dubai@mofat.go.kr according to UAE MOFA information, might be a typo). South Korean consulate established in Dubai in 2007 according to ambassador letter. 09 May 2010 - Mr Hong Yong Jong reported as new Korean CG in Dubai. 26 Feb 2008 - announcement that South Korean consulate in Dubai official opening ceremony would be on 12 March 2008. Consul general is Kyu-ock Park. A number of sources list information for the Spanish Embassy in Dubai, contact details tel +971-4-6269544 (04-6269544) and fax +971-4-6274978 (04-6274978) but they appear to be the contact details for the Spanish Embassy in Abu Dhabi with an incorrect area code (04 for Dubai instead of 02 for Abu Dhabi). And it would be unusual for a country to have an embassy in Dubai anyway, almost all countries with a diplomatic presence in Dubai have a consulate (the UK is the only exception that we know of). No other information found for a Spanish Consulate in Dubai. The phone number +971-4-6269544 doesn't exist according to the UAE Yellow Pages, or is not a public listing (last checked 24 Aug 2013). 03 Nov 2015 - CG reported as Abdel Azim Mohammed el-Sadiq (WAM). 23 Dec 2013 (WAM) - new Sudanese CG is Dr Hamdi Hassab Elrusoul Osman. 08 Jul 2013 (WAM) - Sudanese CG Mohammed Al Hassan Ibrahim reported as leaving. New CG name not supplied. Report also referred to him as the "Sudanese Ambassador". Sudanese Consul General is Hassan Ahmed Sulayman El Shihi? 20 January 2011 (DTCM info) - Consulate General of Switzerland, PO Box 9300, Dubai, UAE. Tel +971-4-3290999, fax +971-4-3313679, email dai.vertretung@eda.admin.ch. Website www.switzerland.ae. Previous or updated telephone +971-4-3313542? 07 February 2012 - Gulf Cooperation Council (GCC) countries announced they were expelling Syrian ambassadors in response to the increasing violence in Syria. Presumably that includes Consuls-General although that wasn't clear from the news reports. China = People's Republic of China (PROC), see Chinese consulate in Dubai or embassy in Abu Dhabi. Includes Hong Kong and Macau. Taiwan = Republic of China (ROC), whether or not you recognize Taiwan as a separate country from China depends on your perspective, but Chinese (PROC) visas are not valid for entry to Taiwan, and vice versa. Apply for Taiwan visa at Taiwan Commercial Office in Dubai, or eVisa online. www.roc-taiwan.org/dxb/ - website for Commercial Office of the Republic of China to Dubai, UAE. www.roc-taiwan.org/dxb_en/post/644.html - eVisa program information, launched 12 Jan 2016, available for UAE citizens (and other GCC nationalities) from 18 Nov 2016. Also for citizens of Dominca, Montenegro, Philippines (1 year trial period). www.roc-taiwan.org/dxb_en/post/125.html - visa information (12 Nov 2013, updated 18 Oct 2015). [Check] Contact tel +971-4-3358177 also given (source unknown, not confirmed). Director General of Dubai office is Mr Jerry Yang (. Location: Sharaf Travel Building, 153 Khalid bin Al Waleed Road (Bank Street), Bur Dubai. Postal address: PO Box 3059, Dubai, UAE. Email corocdxb@gmail.com (not confirmed, looks suspicious as it's a gmail address, but is listed on official website). www.roc-taiwan.org/dxb/ - official website. Also check: www.mofa.gov.tw. 19 Jun 2013 (WAM) - new Tajikistan Consul General for Dubai reported. Name and start date not supplied. Presumably WAM was referring to the new CG appointment reported December 2012. 12 Dec 2012 (Asia-Plus news) - new CG in Dubai reported as Abdurahmon Ayubov, previously the Tajikistan Trade Representative in Dubai. Presumably not the same as or connected to Abdul Rahman Ayoub (or Abdulrahman Ayub - an Indonesian living in Australia, apparently with connections to the Jemaah Islamiyah group). Previous CG was Nosirov Rahimjon? Location - Villa 5, Street 4A or 4C off Umm Al Sheif Street (behind Spinneys supermarket Umm Suqeim), Safa 2 (Jumeirah - Umm Suqiem), Dubai. Postal Address: Consulate of the Republic of Tajikistan in Dubai, PO Box 114339, Dubai, UAE. Tel +971-4-3945814, +971-4-3945815, +971-4-3945810. Fax +971-4-3945812. Email dubaitajcons@gmail.com. 12 Sep 2014 - Consul General is Omary Mjenga Rajabu. Note that Cleophas Ruhumbika is the Consul for Commercial Affairs, not the CG as stated in some sources. Ref: Tanzanian consulate website. 13 Mar 2012 - Consul General (or ambassador?) Ali Ahmed Saleh reported as leaving (WAM). Replacement name not supplied. Official website www.tanbizdubai.com. Email address tzconsdb@emirates.net.ae (also tzconsdb@eim.ae). Postal address PO Box 7545, Dubai, UAE. Tel +971-4-3940200, fax +971-4-3949202. Location Villa 25 [check]? Street 12A, Al Safa 2 community district, Jumeirah. Near the Chinese Consulate, and next to Little Horizon Nursery. 21 Jan 2013 (WAM) - new Thai Consul General is Thosaporn Moonla Sart Sathorn. Previously, Acting CG was Mr Fabio Chinda. 27 Oct 2012 - visa applications for Thailand must be done online from 01 November 2012 - applicants will receive an appointment time to visit the consulate with their application documents. Opening hours: Visa submission 0900-1130, visa collection 1000-1130, Thai passports 1400-1600. Open Sun-Thu. Telephone +971-4-3489550 (previously or alternative +971-4-3492863), fax +971-4-3488568. Location villa 35, street 16, community 366, Umm Suqeim 3, near Raffles International School. Postal address PO Box 51844, Dubai, UAE. Website for Thailand consulate in Dubai is www.thaiconsulatedubai.com (available in Arabic, English, Thai). Email thaidub@gmail.com or thaidub@emirates.net.ae. 29 February 2012 - new consulate-general reported as Ms Elif Comoglu Ulgen (WAM news). Ugandan embassy or consulate planned but delayed. AllAfrica.com reported 24 February 2009 that "The Parlimentary committee on foreign affairs yesterday heard that no money was provided for this financial year for the consulate in Dubai, where Prof. Semakula Kiwanuka was posted." Then on 22 October 2009 reported that a Ugandan Embassy opened in August 2009 in Abu Dhabi. Contact details and location not supplied. 05 April 2012 (WAM news) - Ukrainian Consulate first opened in Dubai. Ukrainian Consul General is Dubai Petro Holoveshko. Contact details, location, website, email, etc not supplied. 11 Nov 2012 (WAM) - new British CG in Dubai reported as Edward Hobart. 17 Jul 2012 (WAM) - British Consul General in Dubai, Guy Warrington, reported as leaving. New CG name not supplied. Location: British Embassy Dubai, Al Seef Road, Bur Dubai, near Dubai Creek. Postal address: British Embassy Dubai, PO Box 65 Dubai, United Arab Emirates. Telephone +971-4-3094444, fax +971-4-3094301. Tel visa enquires - see visa section below. Tel +971-4-3971070 was a previous number for the British consulate (listed in many sources) (unknown if still valid)? Office Hours: 0730-1430 (UAE time) Sun-Thu. Consul General in Dubai is Edward Hobart, started Aug 2012, previously was in British Embassy Abu Dhabi as deputy head. 20 January 2011 (DTCM info) - British Embassy in Dubai, PO Box 65, Dubai, UAE. Tel +971-4-3094444, fax +971-4-3094301. Website ukinuae.fco.gov.uk. www.gov.uk/government/world/organisations/british-embassy-dubai - British Embassy Dubai information. www.ukba.homeoffice.gov.uk/countries/uae/ - start here for UK visa applications (Home Office UK Border Agency). www.gov.uk/government/world/united-arab-emirates - start page for British embassy information in the UAE (Abu Dhabi and Dubai). ukinuae.fco.gov.uk - was a UK Embassy website? Forwards to www.gov.uk/government/world/united-arab-emirates (last checked 24 Aug 2013), still listed in a number sources as the embassy website. www.britishembassy.gov.uk/uae - not available (last checked 24 Aug 2013). Still listed in some sources. www.britain-uae.org - no longer valid (is spam, last checked 24 Aug 2013), listed in a number of sources as the UK Embassy website. UK visa applications in Dubai processed at the VFS Global Visa Application Center in Dubai. Website www.vfs-uk-ae.com. Applicants need to book an appointment online for visa application submission prior to visiting the center. And first need to fill in a visa application form online at www.visa4uk.fco.gov.uk before attending an appointment. Location is UK VFS Visa Application Center, 2nd floor, Wafi Mall, Umm Hurair, Dubai. Postal address is PO Box 114100, Dubai, UAE. GPS coordinates 25.229167 N, 55.318611 E.
Opening hours 0900-1600 for application submissions, 1600-1700 for passport collection, Sun-Thu (closed Fri-Sat). Ramadan hours 0900-1400 for visa application appointments, 1400-1500 for passport collection. Closed on public holidays (UAE and some UK holidays). VFS Call Center in Dubai tel +971-4-2055800, operating hours 0900-1700 Sun-Thu (0900-1500 during Ramadan). Email infoauh.ukae@vfshelpline.com. Contact for information, application appointments cannot be booked through the call centre or email. Emergency telephone for US citizens in Dubai and UAE Northern Emirates when consulate is closed is +971-4-3094000. A concern specific to Dubai is the lack of drinking water in the consular section waiting room. The rest of the consulate general has ready access to drinking fountains, but the waiting room has none. Applicants, whether Americans or others, must wait in line outside in the heat and are not permitted to bring liquids with them; water is available only by purchasing it at a snack bar. Recommendation 26: The Bureau of Overseas Buildings Operations, in coordination with Embassy Abu Dhabi, should install a water fountain in the Dubai consular section waiting room. May 2014 report available at http://oig.state.gov/documents/organization/227278.pdf. Previous report June 2010 available at http://oig.state.gov/documents/organization/145650.pdf. 03 Sep 2013 - Robert Waller is still US CG to the UAE according to a WAM report. On 09 Jun 2013 (WAM) he was reported as leaving. 13 Sep 2013 (Friday) - the US Consulate in Herat was attacked by the Taliban. See the embassy page for more details. 11 Aug 2013 - the American embassy in Abu Dhabi (see that page for more information about the closures) and consulate in Dubai will reopen to the public (reported 10 Aug 2013). 06 Aug 2013 (news reports) - the US consulate and embassy in the UAE (and other Middle East cities) will remain closed until at least Sat 10 Aug 2013 as a precaution against fears of a possible Al Qaeda terrorist attack in the region. 01 Aug 2013 (consulate message) - American Embassy in Abu Dhabi (see that page for more information and updates) and consulate in Dubai will be closed on Sun 04 Aug 2013 due to a worldwide travel alert resulting from an unspecified Al Qaeda terrorist threat. The consulate might be closed additional days - check directly with them. The travel alert expires on 31 Aug 2013. Other US consulates in Africa and the Middle East will also be closed on Sunday. 09 Jun 2013 (WAM) - US CG Robert Waller reported as leaving. New CG name not supplied. 11 Sep 2012 (WAM) - new US CG to Dubai reported as Robert Waller. 07 Jun 2012 - US Consul General Justin H. Siberell reported as leaving (WAM news). Name of new CG not supplied. Not clear what happened to Jennifer Rasamimanana - maybe is Acting CG again? 07 Dec 2011 - US Consul General to Dubai reported as Justin H. Siberell (WAM news). Previously was Jennifer Rasamimanana? Consul General changed again? 07 Aug 2011 - USA Consulate in Dubai moving to new premises, next to the British Embassy at Dubai Creek. No visa interviews will be held from 31 July to 04 August 2011. Previous location was the Dubai World Trade Center, where visa applicants had to wait for literally hours outside - horrible in mid-summer with no shade. New consulate building has an inside waiting area with a/c and seats for 200 people. 07 Aug 2011 - Acting US Consul General in Dubai is Jennifer Rasamimanana (in 2011). Previous Consul General was Justin Siberell? Date of change not supplied. 07 July 2012 (WAM) - Consul General reported as Alfredo Cazes. [Check] Location is Al Jafiliyyah? See also expat population in the UAE figures. Approximately 200,000 UAE nationals living in Dubai in 2012. Arabs, expat - 120,000 (2011 estimate, source unknown). Bangladesh - 100,000 (2011 estimate, source unknown). China - 150,000 (2012 estimate, source unknown). About 300,000 in UAE reported 31 Mar 2016 (WAM). Egypt - 60,000 (2011 estimate, source unknown). France - about 10,000 French nationals in Dubai (The National 14 Feb 2012). India - 650,000 (2011 estimate, source unknown). Iran - 150,000 (2011 estimate, source unknown). Ireland - about 5,000 Irish expats in Dubai (19 Jan 2012 press release about the launch of Emirates flights from Dubai to Dublin). Italy - about 3,000 Italians live in the Dubai (The National 03 Jun 2012). Pakistan - 200,000 (2012 estimate). Philippines - 175,000 (2011 embassy or consulate estimate, not confirmed). South Korea - about 2,000 Koreans living in Dubai (Khaleej Times or press release 26 Feb 2008 about new consulate opening in Dubai). Sri Lanka - 50,000 (2011 estimate, source unknown). UK - 40,000 (2012 estimate). Almost all of them in Double Deckers on Thursday nights. USA - about 20,000 Americans living in Dubai and the Northern Emirates (Gulf News 03 Oct 2012). Western (excluding UK and USA) - 30,000-40,000 (2012 estimate). Last update Sunday 12-Aug-2018. Page development 1H 2T 3D 4L 5C. Consulates and embassies in UAE - old information and general information. Embassies in Abu Dhabi - list of foreign diplomatic representation in Abu Dhabi. UAE embassies overseas - list of UAE diplomatic offices in other countries. www.dubaifaqs.com/consulates-in-dubai.php (PDF and print version).